LakeDiamond is a pioneer in the production of laboratory-grown diamonds for high-tech industrial applications along with micromechanics, electronics and biotech. LakeDiamond uses a process of chemical vapor deposition to grow its diamonds, an approach that ensures their unique purity and reproducibility. Today the startup has signed its first industrial partnership with Abu Dhabi National Energy Company PJSC (TAQA), a leading water and energy company with assets in 11 markets around the world. 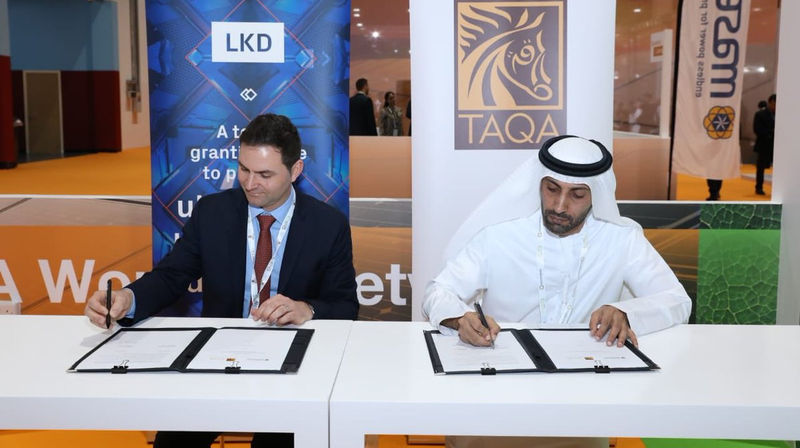 The agreement aims to strengthen TAQA’s energy evacuation system and redundancy by leveraging LakeDiamond’s power-beaming technology and use of photovoltaic cells to make electricity more accessible across one of TAQA’s core markets and reduce energy costs. The partnership will focus on projects where energy produced by TAQA can be wirelessly transmitted through lasers incorporating lab-grown diamonds to high power photovoltaic panels located up to several kilometers away and converting light into electricity. “Today’s announcement is a technological leap for the energy sector, and we look forward to collaborating with TAQA on this innovative initiative for the future of sustainable energy distribution,” says Pascal Gallo, CEO of LakeDiamond. “TAQA is committed to exploring the most cutting-edge technology to enhance efficiency and contribute to more sustainable energy sources. Our new partnership with LakeDiamond, starting in Morocco, will contribute to cost-savings and provide an important use case for laser technology that we could potentially replicate across other assets”, says Saeed Hamad Al Dhaheri CEO of TAQA.